GEOFFREY CIANI: Naazim, it was a sad day for boxing and we lost one of our greatest ambassadors in the sport when Emanuel Steward passed away nearly two weeks ago. I’m wondering if you could share your personal views on the impact that Emanuel had on boxing? NAAZIM RICHARDSON: Well like you said, Emanuel was a great ambassador for the sport and a very intricate part of the sport as we know it in the last few years, and he touched on all facets of it in that he was, you know a commentator, trainer, manager, promoter. He was just in every detail of the sport, and like I’ve said, it’s a great loss but it’s one of those situations where we lose, but in a sense there’s a piece of Emanuel that’s going to exist forever in the sport from when he sat down and what he let the world share from the Kronk’s Gym on to when he was analyzing the fights as a commentator. So he’ll be with us as long as the sport is around. CIANI: One of the things I remember that Emanuel said about you once, it was when he was still training Chad Dawson and he was looking forward to the challenge of going up against you, and Bernard, and all of the great boxing minds from your corner. He actually said it reminded him of when he was training Evander Holyfield and he had to go up against the old school corner led by Eddie Futch. One of the things Naazim, you’re known as a great preparer of your fighters, and I’m wondering if you could tell the fans out there how you gauge Emanuel when it came to preparing his fighters to give them their best chance at victory? RICHARDSON: Well Emanuel was a different character in the sport. You know, okay. I see it in a sense like with Magic Johnson. Every player on the court was a better player when Magic was on the court. So you may have been a decent player, but when Magic was on the court he increased you by two or three fold, and Emanuel was very much like that. He had fighters who could have been decent fighters, but with Emanuel Steward they actually became better fighters. It actually worked as a double-edged sword, because Emanuel was the kind of guy who could walk in with a fighter you never heard of, but people would see Emanuel Steward and it would make everybody take the fighter a little more serious. So some kids that might have snuck by didn’t get a chance to sneak by if they were with Emanuel. You had to take them seriously the minute you saw Emanuel taking any interest in them. CIANI: When you think of Tommy Hearns, Emanuel, and the Kronk Gym, what are your memories of that duo of Tommy Hearns and Emanuel working together? RICHARDSON: Well, special people give us special results and give us a special output. Tommy and Emanuel’s relationship in boxing period is a rarity. We see a trainer who gets an opportunity to be with an athlete. Emanuel took Tommy Hearns from the amateurs to the Boxer’s Hall of Fame. Now how rare is that? From the amateurs to the Boxing Hall of Fame; you know that’s a long journey, and very few people stick it out. The variables change a lot on that long a journey. You know for these guys to be there like that, it was something special. And just the network and family he built around the Kronk Gym was just legendary, and like I said, Emanuel is the blueprint for what a lot of these young coaches are trying to do out there today. CIANI: From a trainer’s perspective, what do you think those experiences must have been like for Emanuel, or for any trainer, to have been in the Kronk Gym in the late 70s and early 80s especially, when it was a talented rich organization dealing with a high level of talent on a daily basis. How special in your opinion Naazim was something like that in making him who he was? RICHARDSON: There’s a thing I offered the other day in the gym with the guys who had the opportunity to work with Emanuel and work closely with Emanuel. I told all of the athletes, “Anybody who has their Kronk outfits, let’s wear them this week in honor of Emanuel Steward”. And it’s crazy because he had drew me up a Kronk shirt years ago and I had yet to put it on. Well one, I teased Emanuel. When he first gave me the shirt, I said I was too big for it. It was too small, and then finally a lost a few pounds so I could get into it. CIANI: When you think of the success that Emanuel had in heavyweight championship fights, it’s funny to think that before him and Lennox Lewis worked together, that Emanuel actually trained Oliver McCall to beat Lennox Lewis right before he started working with him. When you look back on that ironic little twist in their relationship, what do you think Emanuel was able to do for the career of Lennox from that point? RICHARDSON: Emanuel added a confidence to the fighters that he worked with. His legacy was written and cemented long ago in our sport. So all of those fighters who came along later in those years, they gained a certain confidence in knowing that this was tried and tested rituals that they were being asked to perform and follow in training, because Emanuel had crossed those marks so many times. Like I said, it just created a confidence in a guy, you know what I mean. So Emanuel just being involved with athletes could make an athlete a better athlete. I won’t call names out, but he’s taken some ordinary guys and done some special things with them, just simply because they believed in him and they were willing to fight for him. They would do things for him that they wouldn’t have accomplished for themselves. CIANI: I think a good example of that could be the current heavyweight champion Wladimir Klitschko, who actually has a fight coming up this weekend. When Wladimir was knocked out by Corrie Sanders, he paired up with Emanuel not long after that and in their first fight together, Wlaidmir actually suffered another setback when he faced Lamon Brewster. I’m just curious Naazim, at that time after Wlad had suffered those two devastating type of losses, did you ever think he would be able to rebound to the point where he is now, where people view him as virtually being unbeatable? RICHARDSON: Well, in part I understand what you’re saying. But you know, I mean I know you don’t mean it in that sense, but just for me, just for the record there’s no such thing as ‘unbeatable’. It just doesn’t exist. If Ray Robinson can lose, everybody else can lose. But I would say Wladimir had the attributes and the weapons that made you realize that him dealing with somebody like Emanuel, you came to recognize he knew with a guy like Emanuel you could see him taking the run that he took. He was big, he was athletic, he was dedicated, and he was very smart. So with those kind of attributes, that can breed success. Once him and Emanuel got a better understanding of each other, it put Wladimir on a run that’s just ridiculous. CIANI: The one moment in his career that he always said was his proudest moment as a trainer was when Evander Holyfield avenged his first loss to Riddick Bowe in their rematch in the infamous ‘Fan Man’ fight. What did you think at the time when Holyfield and Bowe were having their rematch, and did you think that Holyfield had a good chance of reversing it going into that fight? RICHARDSON: Evander Holyfield is one of the few fighters in boxing history that he had an opportunity to beat any man he ever faced. Any athlete who has the courage that Evander carries and brings the conditioning and the commitment, then they have a chance to beat anybody they face and Evander was one of those guys. He was one of those guys. He was never in a fight where you were just like, “Well he’s not going to beat this guy”. I thought there was a good chance that Bowe could beat him because Bowe was so big, and young, and hungry in the first fight. But I would not have been shocked if Evander would have won the first fight. You just couldn’t look at Evander like that. You could never count Evander Holyfield out. He was just one of those fighters you could never count out. CIANI: How integral do you think having Emanuel was for him in the one of the three fights he won? RICHARDSON: Well I can’t say it enough: Emanuel was an intricate part of anybody’s team always. This is why we throw the word ‘legend’ around, but he was a true legend in the sport. So I realize, but on the same token it’s not to disrespect Emanuel, but I don’t take anything away from Evander in that sense. Them being together was just more problems for whoever was in the other corner. But Evander, especially at that time in his career, Evander was just a problem. Even your wins over him weren’t going to be easy. CIANI: The most visible role that boxing fans have had the opportunity to see Emanuel, you mentioned it earlier, was as HBO’s Boxing Expert Analyst where we got a chance to listen to Emanuel give his views on the fights on a play-by-play basis. 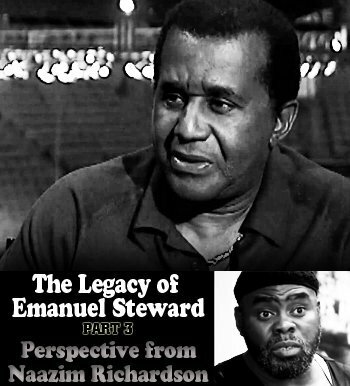 When you think of Emanuel as a commentator Naazim, what are your views on the legacy he left in the aspect? RICHARDSON: Well he was very informative because of his history in the sport. You know he was very informative because of his history in the sport. I might not be one who’s fair to comment on commentating because a lot of times I watch the fights without the commentating on it. I turn the volume down because sometimes I feel like commentators can actually be influential with what you’re watching, especially with this Pacquiao kid. But Emanuel’s expertise was just an expertise that was based on the actual interaction and the actual emotion that’s a part of the athlete’s climb and rise and fall in the sport. So he had witnessed every aspect in the sport from the rise of a Tommy Hearns to the disappointment of the Ray Leonard fights with Tommy Hearns, and that kind of thing. And when you just have that kind of experience, it comes across when you’re commentating. CIANI: As a trainer Emanuel always stressed to me that for him, the most important things he tried to implement into his fighters was (1) balance and (2) working behind a solid jab. Those were always the two key points he liked to stress. As a well known strategist in the boxing world yourself, what did you think of Emanuel’s overall philosophical outlook as a trainer? RICHARDSON: We discussed this several times, me and Emanuel, and we came to agree on that point very much. The jab is underused and underestimated and not as highly regarded as it should be, but it’s almost like anything that you talk that much about people take for granted. Like I said the body of work has proven itself; his body of work and what he’s done with a lot of big men, like I said it goes without saying. Like I said there’s always going to be haters. There’s always going to be guys who when any guy is getting attention, they’re going to discredit it and just throw them all into a big lump and discredit him and disregard him, and they speak of him in terms of, “Oh! Emanuel Steward and Freddie Roach”! You know and they just throw these guys into a corner and they don’t want to give them credit. But me myself, I’m perfectly happy to give these guys credit for the accomplishments in front of them. You know and for the people who like to try and emphasize, “Well did you make the fighter? Did you teach him from ground one?” and like I said, hey! He took Tommy Hearns from the amateurs to the Hall of Fame. So you can’t discredit him when you try to talk about trainers in their pool or when they start working with a guy and that guy was already a good fighter, and that kind of thing. CIANI: Now you in a sense have touched on this, but his three signature fighters are Tommy Hearns, Lennox, and Wladimir. Do you think, and I know you do have to give the fighters credit in these situations, but do you think they would have gone on, all of them, to become the Hall of Fame type fighters they are without Emanuel’s guidance? RICHARDSON: I don’t think you can ever truly answer that question fairly. I just don’t think you can answer that question and be fair to the athletes or be fair to Emanuel. I think definitely Emanuel has to play a part in it because he’s proven it time and time again. All three of these guys are first ballot Hall of Famers. What’s the one common denominator there? Emanuel Steward. They’re not all in the same weight class. Maybe they’re all right handed punchers, but you can give a great deal of that credit to Emanuel, too. So I think I can’t look at these guys and say they wouldn’t have made the Hall of Fame without Emanuel. You know what I mean? But I could never denounce Emanuel’s input in them getting there. That’s just one for each individual to absorb on their own. You know I appreciate what Emanuel did for the guys, as well as I appreciate what the athletes bring to the table. CIANI: Naazim, I just have one final question for you, and basically it’s an open ended question where I’m wondering if you have any final thoughts regarding Emanuel Steward that you would like to share, whether it was a personal experience, or anything that pertains to any of your views on him or his impact on boxing? Do you have any final thoughts? RICHARDSON: I had a great deal of respect for Emanuel at each and all levels, but the one thing that strikes out for me with Emanuel is his consistence. In this sport it’s easy for us to burn out, it’s easy for us to get fed up, to get tired, to get disappointed in athletes not making as deep as a commitment as the trainer himself, and he was consistent throughout all of those highs and lows. He was always a fixture in the sport, he was always a consummate professional, and he was always constant. He was there! He was always in the mix, always a step away from being in the picture with the athletes, and I thought that was just tremendous over the years because you can just get tired and get burnt out. This guy stayed. He always still had the enthusiasm and always still had the energy. I’m proud to say I knew the man. I’m honored to say I had a personal communication and I’m fortunate to be able to say that I got to see him work. So these things man are just like, in this journey on earth that we have, the Lord provides us with different spirits that we interact and we crash and collide with. I praise the Lord that I got a chance to interact with a man of this magnitude, with a man of this importance to a sport that I adore. It was a heck of a journey that he put in, and he did it with style, and like I said consistency, and intelligence. We have to appreciate that and be thankful for the time we had. I know as long as I’m around in the sport I won’t forget him or forget the conversations we had, especially the last conversation we had. In the last conversation we had he called me about some sparring, and we got to talking, and I was telling him we had just lost a trainer here in Philadelphia named Willie Folk. And he was like, “Hey Naazim, you guys are losing a lot of the guys down there”. He said, “There’s not too many of the old school guys left around down there, man”. I said, “Yeah, it’s a sad fall”. He said, “Yeah, it seems like that everywhere”. And that’s crazy! That’s the last conversation we had was about how we’re losing all of our old trainers. Then right afterwards we lose this guy. But you know it’s like I said, we have to celebrate the fact that we had him and be thankful for the positives, the plus, the push, and the mark he left on this sport. And all we can do is move forward and just pray we can do the best job we can before we leave out. His work is done. He completed his task and his work is done, and it’s time for a rest for him. You know what I mean? So for the rest of us we still have work to do until it’s our time, and we can just hope we can get some of the work done too before it’s our time for rest. But God bless what an outstanding individual, and you know all we can do is celebrate that.